The number one disease in the world is caries, the cause of tooth decay as we know it. Caries is a disease of acid production, the bi-product of breaking down sugar and carbohydrates. The bacteria involved in this crime are mainly two in number out of perhaps 900 in a film on our teeth. A biofilm is on every surface where a liquid moves through a tube, water line, pipeline, and on our teeth. 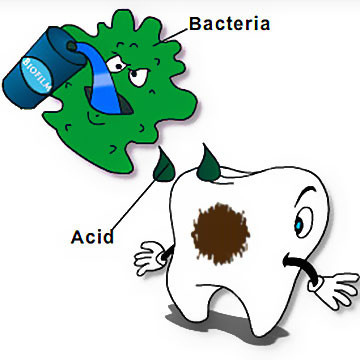 Within this biofilm is an extremely complex environment of interplay between the bacteria that when the pH, a measure of the acid level, gets toward the acid side below a number of 7 (neutral), our teeth are attacked by the acid. The more acidic it gets the worse it is for our teeth. The newest discovery is as the acid level increases (pH drops), more bacteria starts producing acid. This is very new research. So what does this mean for you? Well, if you currently have a biofilm that does not produce enough acid to harm your teeth, you get "good check-ups" at each examination. However, IF an examination shoes new decay has appeared on any given tooth, you now know you have the disease Caries. One solution is to think you can brush/floss more, but that will not change the biofilm. We can test for Caries BEFORE it strikes. It can only be modified with medication, and if you test positive, medication can control the biofilm to get your pH back to 7 (normal).